Find out how you can complete your degree. Bethel University has established an Articulation Agreement with Argosy University to make your hard-earned credits transfer easily. 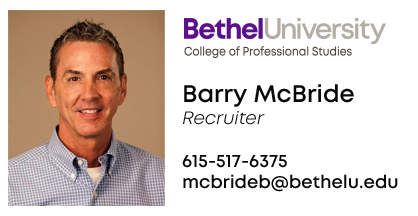 Additionally, Bethel University will conduct an individual assessment of your Argosy University credits to determine how we can help you finish the degree you have worked so hard to earn! Join us for a VIRTUAL information session to find out more. To register for the session, click on your preferred time below or contact Barry McBride.